Emerging from the holiday season, there is a special kind of sentimental longing that descends upon us as we step into a New Year and return to the not so festive tasks of everyday living. I was privileged to attend this season’s holiday programming at our Nationwide Healthcare Services Centers in Pennsylvania and Delaware. Each of them featured activities and special events, tailored to the Residents’ needs and religious observances, which were carefully timed to allow their family members to participate. In my post-holiday reverie, I quickly recognized the transcending nature of kindness: how it not only makes things happen – it casts a glow on everything it touches. Case in point: it was brought to my attention that Nationwide’s newest facility was in need of holiday decorations – and Christmas trees. A text to Mr. Meir Gelley, owner of Nationwide Healthcare Services, brought back a quick response: “Yes, of course, please take care of this.” No hesitation on his behalf to provide the Residents everything they needed to bring the holiday spirit into their environment. At another facility, a group of home-schooled students came to sing carols – for the fifth year. Standing at the back, the Activities Director proudly listened to the parent leading the group who, having learned well from previous visits, addressed the children saying, “Some people will be in wheelchairs or may not speak, but it is okay to give a hug and share a smile”. Then a truckload delivery of personalized gifts for every Resident arrived from a local power company – not for one, but for two Nationwide Centers! And how could we experience the holiday season without Santa? He arrived to deliver gifts to each Resident during a holiday party. The gifts, mind you, were provided by “angels”: Nationwide TEAM* members who chose a Resident from the “angel tree”, purchased a gift, and wrapped it. Visibly moved by a thoughtful gift of socks from his homeland, one of the Residents was actually brought to joyful tears. 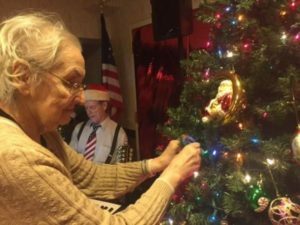 Yet at another facility, Residents were empowered to give back to the community: cards were made for the local police and fire departments, and items knitted by the Residents themselves were given to a homeless shelter. Indeed, every day of the year each of the Nationwide Centers bustles with a flurry of activity: the shifts of TEAM* members coming and going to care for the Residents, 24 hours a day, 7 days a week, 365 days a year; not to mention the physicians and medical specialists, therapists, ambulance crews, social workers, family members, and caring friends. What is remarkable is that, during the holiday season, the TEAM* members at each facility successfully weave in a harmonious counterpart to the everyday bustle that includes mail carriers, deliveries, volunteers, performers, and out-of-town family and friends paying a visit their loved ones: A carefully planned and harmonious choreography that points to the core values and exemplary care distinctive of Nationwide Healthcare Services. Recalling the sea of gifts at each facility, some of them neatly wrapped and some of them just walking through the door flashing a smile, I am brought back to one of the greatest gifts of this season…the Nativity. Watching the Nativity performed by the TEAM* members and Residents at a facility, I stood next to a Resident who is not verbal. She began to move in her chair, holding out her hand as she seemed to take in the story of the Nativity. I reached out to her and she extended her hand to touch mine, affectionately squeezing it. Hand in hand, transported by the Nativity, fully present and connecting in the moment, we listened to the rest of the performance. In an industry of ever-changing regulations, care needs, compliancy, insurances, and technology, at times feeling spread thin and running hard, this personal moment of reflection points to the fabric that holds it all together: the abiding compassion we bring to our Residents every day of the year – and the priceless gift of knowing we have made a positive difference in their lives. TEAM * is the core of Nationwide’s success: Together Everyone Accomplishes More. For more information about Nationwide Healthcare Services, Inc. please contact Meg Judson, M.H.A., Corporate Director of Business Development Nationwide Healthcare Services, Inc. at mjudson@nationwidehealthcare.com. This post originally appeared at http://patch.com/pennsylvania/media/real-gifts-holiday-season-nationwide-healthcare-services-inc.
← The Dedicated Staff of Professionals At Renaissance: Ready to bring joy to our residents in the spirit of Halloween!